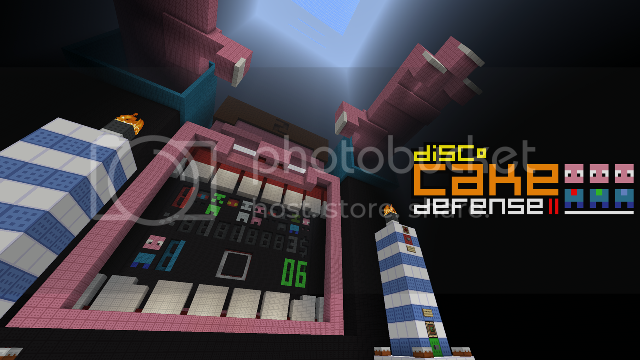 Cake Defense 2. Defend your Cake! Defend the cake from 24 waves of Herobrine’s minions. Earn gold by killing mobs, buy upgrades and abilities. Command blocks need to be enabled on servers. This game is not compatible with Bukkit. Make sure Weather is turned on if you use Optifine. Play on a clean Install of MC if you are having problems. This one is much better then the first one! The "complex" leveling system is quite genius. But..., I downloaded and started playing it, but when the round starts, no mobs spawn. My difficulty is set to hard, no it's not a peaceful issue. It's really really impressive ! But how do you make semi-transparent blocks with a futuristic effect ? 2 passes with the camstudio mod, 1 normal pass then 1 naked pass, then blended with video editing. I'm excited about playing this map, it looks extremely well done. Unfortunately I ran into the same problem; no mobs will spawn, no matter what. I tried the simple "reset" and made sure to chose another difficulty, I tried opened to LAN (even turned on commandblocksoutput and everything was on), tried re-installing the map and followed all steps properly. I spawned on peaceful, changed it to normal, then to hard since it didn't work. I did also use different difficulties in the map itself. Same thing happens to me.. I'm not in a server either. hmm wierd, what version minecraft? and do you have any mods installed? looks like you are stuck in the middle of a round too. If that does not work try re-downloading the map. It's not just him it happens to me to I really would like it to be fixed, I have Optifine thats it. Same thing happens with me I hope he fixes it..
Wow this is amazing do you think you will do another speed course map maybe mario? I can not replicate this bug, and as 1000's of people have played it now, it must be a rare thing. fly up above the redstone and see if the clock is on. You will see all the redstone pulsing. if its not pulsing that will be the problem. I did all of that and when I tp'd to 0 0 0 it was all pulsing.. but when I went back nothing, it's weird.. I think your problem is SPC. SPC doesnt really love command blocks. delete that and see if it works. Awesome map dude! But at the same time its near to impossible to get past round 3 or higher.